Go green with red, white, and blue this Fourth of July! Use these plastic bottle crafts to celebrate the nation’s birth while still being eco-friendly. You can make a Patriotic Water Bottle Bracelet from Heidi Borchers using an empty plastic water bottle, embroidery thread, and some red, white, and blue buttons. Follow the easy tutorial to get the step-by-step instructions. 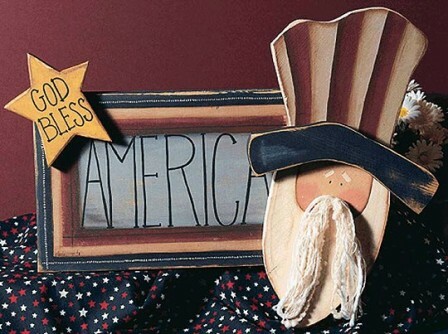 Wear this patriotic craft on Independence Day to celebrate the U.S.A. Your friends will never be able to guess what your fashionable bracelet is made of! 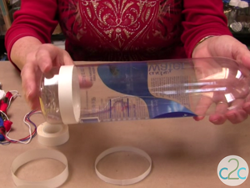 Working approximately 1″ up from bottom of bottle, apply Aleene’s Fabric Fusion Peel & Stick Tape around bottle. Space tape approximately 1/4″ apart on bottle. 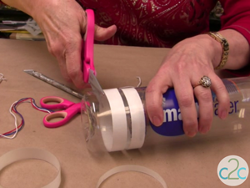 Using craft knife, carefully punch into side of bottle and cut along tape line approximately 3″. Use scissors to cut out bracelets. Punch holes in bracelet using largest button as measurement for spacing. To apply floss, peel back liner paper approximately 1″ at a time and wrap floss around and around. To keep floss from knotting, leave wrappers on skein and only pull out a small length at a time. Wrap entire bracelet. Use Aleene’s Tacky Glue to glue ends of floss to inside of bracelet. Stack buttons and stitch through holes on bracelet. For a comprehensive video tutorial of this project, check out How to Make Friendship Floss Water Bottle Bracelets and How to Embellish a Floss Bracelet with Buttons. For more incredibly easy Independence Day projects, take a look at these amazing 16 Free July 4th Crafts.